This exclusive Revive Us bundle is complemented with a beautiful and understated 'Time to Pray' print on white. This 18x24" piece lets you display your faith with pride. 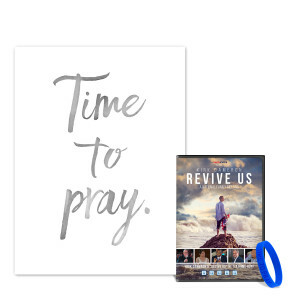 The bundle also includes Kirk Cameron's Revive Us DVD and a blue 'Time to Pray' rubber wristband. Revive Us was a live event held in October 2016 and broadcast to a theater audience nationwide of more than 150,000 people. Join Kirk Cameron and guests like Ben Carson, Pastor Francis Chan and Eric Metaxas for thoughtful discussion on faith, hope and optimism. Click here to buy the Revive Us DVD separately, or here to get the Wall Art separately.